Using the Juno-106’s diagnostic mode (transpose held while switching on) and stepping through the 6 voices revealed that the VCF-VCA combo was dead on both voice 3 and 4. This is a commonly known problem on Juno-106 synths as their VCF-VCA hybrid chips called 80017A have a tendency to fail. See the Juno 106 VCF/VCA Teardown page for more specific information on this hybrid IC. Easy to diagnose but much harder to find original replacement parts. 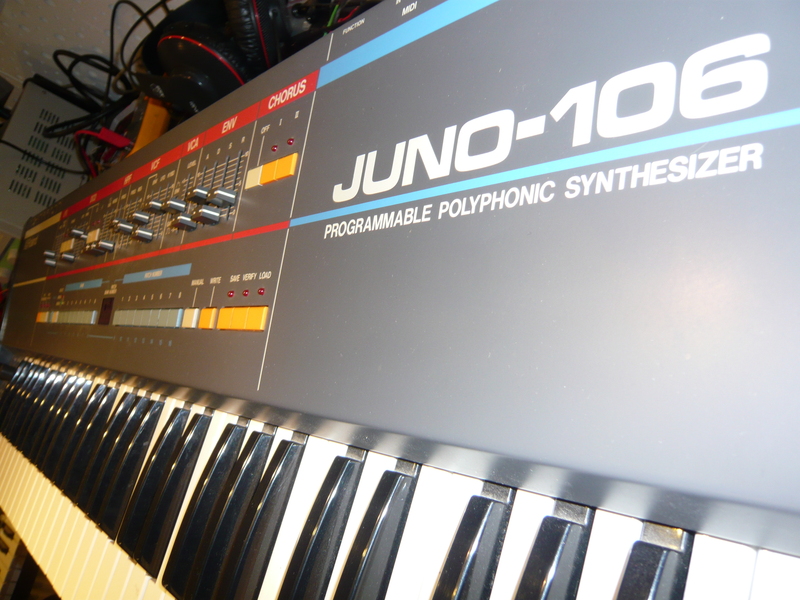 Actually, for the last Juno 106 I repaired some years ago I had even been able to get original spare parts from Roland but that’s not possible anymore. Luckily, some people have made the effort of recreating this part by analyzing it throughoutly and substituting the non-available components for modern equivalents. I have used the 80017A replacement from Analoguerenaissance, a guy from Belgium who made an excellent clone of that 80017A. The replacement procedure is fairly simple, the defective modules have to be unsoldered and then replaced with the spare module. After replacement a complete recalibration of the synth is recommended in order to adjust the new modules to the circuit and make them sound exactly the same as the other voices. After tuning, I can only say that these modules sound exactly the same as the original Roland 80017A VCF-VCA’s! An amazing job from Analoguerenaissance and well worth the money.